Alford Image Library - Alford WRI in a one act play, "The Gundy Shop"
Alford WRI in a one act play, "The Gundy Shop"
Dated December 21st 1934 from the Aberdeen Bon Accord and Northern Pictorial. 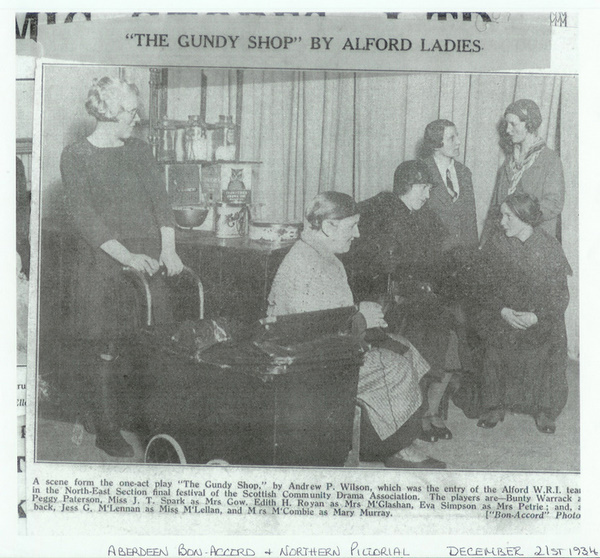 The Gundy Shop was a one act play written by Andrew P.Wilson and performed by Alford WRI as their entry in the North East Section of the Scottish Community Drama Association. Cast: Bunty Warrack, Miss J.T Spark, Edith Royan, Eva Simpson, Jess G. McLennan and Mrs McCombie.